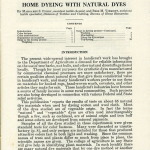 The following small booklet published by the U.S. Department of Agriculture was owned by Katherine Pettit and discloses her continuing interest in the use of vegetable dyes in the weaving process as late as 1935. It would not have been in use at the school when Helen Wilmer Stone was experimenting with vegetable dyes as its later publication in 1935 was well after Stone had left the School. But, it was most likely consulted by Stone after she settled in Saluda, North Carolina and married H.C. Viner and the two published her small 63 page booklet, The Katherine Pettit Book of Vegetable Dyes in 1946. 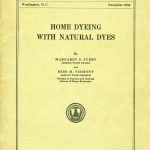 Home Dyeing With Natural Dyes, by Margaret S. Furry and Bess M. Viemont and published December 1935. Description A small booklet that describes the plants (vegetables) suitable for dyeing various organic fibers. The booklet was owned by Katherine Pettit, Founder of Pine Mountain Settlement School, Pine Mountain, Kentucky. Her signature appears on the cover of the government publication. Contributor Hard copy scanned from the Pine Mountain Settlement School Archive, Pine Mountain, Harlan County, KY. Source Original in the Pine Mountain Settlement School Archives, Pine Mountain, Harlan County, Kentucky. Coverage spatial United States of America ; Southern Appalachians ; Washington, D.C.
Rights USDA publication is not copyright restricted. Any publication of this work not part of the original USDA publication must seek the permission of Pine Mountain Settlement School, Pine Mountain, Kentucky. Citation Home Dyeing with Natural Dyes, Pine Mountain Settlement School Collections, Pine Mt. 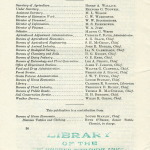 Ky.
001 Cover UNITED STATES DEPARTMENT OF AGRICULTUREMiscellaneous Publication No. 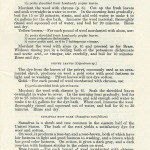 230Washington, D. C.
1 UNITED STATED DEPARTMENT OF AGRICULTUREMISCELLANEOUS PUBLICATION NO. 230Washington, D. C.
The present wide-spread interest in handicraft work has brought to the Department of Agriculture a demand for reliable information on the use of tree barks, nut hulls, and other natural dyestuffs gathered locally. Though for most purposes the synthetic dyes manufactured by commercial chemical processes are more satisfactory, there are certain qualities about natural dyes that give them commercial value in handicraft work, and many handicraft workers prefer to use them on materials for hooked rugs, hand-woven scarfs, coverlets, and other articles they make for sale. These handicraft industries have become a source of family income in some rural communities. Such projects are also being developed in connection with various Federal and State relief activities. This publication 1 reports the results of tests on about 65 natural dye materials when used for dyeing cotton and wool cloth. Most of the dyes studied are of vegetable origin. In fact the terms “natural” and “vegetable” dyes are often used interchangeably though a few, such as cochineal, are of animal origin and iron buff and some others are developed from mineral pigments. Acknowledgment is made to Edna H. Fawcett, assistant pathologist, Bureau of Plant Industry, for helpful suggestions; to C. A. Heed, associate pomologist, Bureau of Plant Industry, for furnishing plant materials; to S. F. Blake, senior botanist, Bureau of Plant Industry, for identifying plants; and to Marion A. Belknap and Mary A. Phillips of the Bureau of Home Economics, for general laboratory assistance. 1 2 2 MISC. PUBLICATION 230, U. S. DEPT. OF AGRICULTUREas a guide for such work. 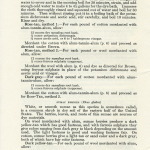 A few States have mimeographed directions 2 for using natural dyes.COLOR FASTNESSThe fastness or permanence of a dye is important, but no dye is absolutely fast under all conditions. It may be fast to light, or to perspiration, or to washing, but not fast to all three. Furthermore, a dye may be fast on one fiber and not on another; or it may be fast when dyed by one method and not fast when dyed by another. Of all the textile fibers, wool can be dyed most easily, and the resulting colors change the least. It combines with practically all dyes, probably forming a chemical union with them. Cotton does not combine with dyes so well, and fast colors are produced on it only by complicated processes. The need for a particular kind of fastness depends on the nature of the color change and the use to be made of the dyed fabric. For example, a fabric dyed brown with tree bark may darken on. exposure to light. If used in a hooked rug this color change might be satisfactory but on the other hand, in window draperies it would soon become objectionable. 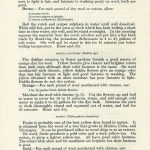 To make sure that the recipes given on pages 8 to 35 produce colors permanent enough to be useful for most purposes, the dyed fabrics were tested for their fastness to light and to washing by the following methods. The results are included in the dye recipes. For the light test, samples of the dyed fabrics were cut and exposed for 40 hours to the rays of a carbon arc lamp. Throughout the test period half of each piece was shielded from the light while the rays of the lamp shone directly on the other half. Then the two parts were compared and the fastness to light rated as follows: Good—no appreciable change of color; fair—appreciable but not objectionable change of color; poor—objectionable change of color. Though these light tests were run in a standard fading apparatus, the same method can be followed at home by exposing samples to the sunlight. Cut 2-inch square openings in each of two pieces of heavy cardboard, fasten a piece of the dyed cloth to one with gummed paper and cover with the other piece of cardboard so that the openings correspond. It is important that the light come through the fabric. Then place this’1 sample in its frame out of doors in the direct sunlight and tilted towards the sun. After a few days remove and compare the section exposed to the sun with the covered portion. 2 3 HOME DYEING WITH NATURAL DYESwarm. The samples were dried quickly, then compared with the original unwashed fabric, and rated good, fair, and poor, as for the light test. A similar test can easily be made at home.COLOR COMBINATIONSThe craft dyer needs to know how to combine colors as well as how to produce them. When harmoniously combined they add beauty and sales value to handicraft articles. Therefore an understanding of a few of the principles involved will aid the dyer in producing satisfactory colors and color combinations. Primary colors are yellow, blue, and red. All other colors are made from them. figure 1.—A color wheel showing the primary colors—yellow, blue, red—and the secondary colors-green, violet, and orange. Secondary colors—green, violet, and orange—are made by combining two primaries. Yellow and blue give green; blue and red produce violet; and red and yellow make orange. Intermediate colors are formed by combining a primary and a secondary color. Mixing yellow with green produces yellow-green; blue with green a blue-green; red with blue a red-violet; red with orange a red-orange; and yellow with orange a yellow-orange. 4 4 MISC. PUBLICATION 230, U. S. DEPT. OF AGRICULTUREare called shades. In dyeing, tints can be made by using less dye material in proportion to the weight of cloth. Shades are made either by increasing the relative amount of dye material or by adding black. Intensity means the brightness of a hue or the amount of a pure color it contains. The intensity of any color is softened or subdued by mixing with varying amounts of its complement or the color opposite it in the color wheel (fig. 1).Certain rules govern the combining of colors. Similar hues may be used together in self-tone and neighboring color harmonies—sometimes called harmonies of likeness. Self-tone harmonies consist of tints and shades of one color such as orange, tan, and brown. Neighboring color harmonies combine colors that are side by side in the color wheel (fig. 1). However, when combining neighboring colors it is best to use only those which lie between two primary hues, for example, yellow-green, green, and blue-green.Combinations of unlike colors are called harmonies of contrast, and of these the complementary and triadic are the easiest to use. Complementary harmonies combine two opposite colors such as orange and blue, while the triadic uses variations of any three colors which are equidistant in the color wheel. 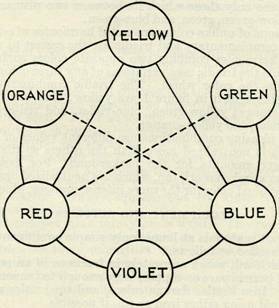 The triadic combinations possible from the colors shown in figure 1 are yellow, blue, and red; green, violet, and orange; yellow-green, blue-violet, and red-orange; blue-green, red-violet, and yellow-orange. The most pleasing combinations use different values of soft colors, one of which is neutralized more than the others so that it can be used in larger amounts for the background. For example, in a hooked rug or a woven scarf, tan, which is a neutralized orange, makes a good background color for the more intense oranges, blues, or greens in the design. Scales, which will weigh accurately in fractions of an ounce. Kettles of enamelware or copper, large enough to immerse the cloth completely. Iron kettles darken colors, and tin kettles make colors harsh, so avoid using either iron or tin, if possible. Large pails or tubs, in which to rinse the dyed fabrics. Gallon, peck, and quart measures, tablespoons, and dippers. Cheesecloth or coarse muslin, for straining the dye liquor. Sticks of smooth wood or glass towel rods for stirring and turning the material in the dye bath. A good stove. If possible, have it set lower than usual so that lifting the water and stirring the goods in the dye bath will be easier. A thermometer to test the temperature of the dye bath and rinse waters. Rubber gloves to protect the hands from dyes. A clothesline stretched in the shade. Soft water, such as filtered rain water. Have plenty of water to cover the fabric while dyeing, also plenty for rinsing. Chemicals and dye materials can be obtained from drugstores and botanical-drug supply houses. Make a suds of good neutral soap in lukewarm soft water, using for each pound of wool yarn or fabric about three-fourths of an ounce of soap to 5 gallons of lukewarm water (95° F.). Wash the material thoroughly for 30 minutes, and squeeze out the suds. Then wash it a second time in lukewarm suds for 30 minutes, this time using one-fourth as much soap. After squeezing out the suds, rinse it 3 or 4 times, 10 minutes each time, in lukewarm water. To prevent felting and shrinking, handle wool quickly and pass it directly from the suds to the rinses without delay. Also have the temperature of the suds and rinses the same and never more than lukewarm. Sudden changes in temperature cause wool to shrink and become harsh. Always squeeze out the rinse water evenly. Never wring or twist wool. Often wool not yet spun into yarn is dyed. The raw wool must first be thoroughly scoured and cleaned to remove the natural wax and grease because these impurities tend to make the fiber water-repellent and the dye cannot penetrate it. After being scoured and dyed, the wool is carded and spun into yarn. Different colors may be carded together to make interesting color combinations. Make a suds of good neutral soap in hot, soft water, using for each pound of cotton material about three-fourths of an ounce of soap in 5 gallons of hot water (140° F.). Wash thoroughly for 30 minutes, wring out the suds, and wash in a second suds, using half as much soap for a pound of material. Rinse once in hot water. For the second rinse have the water still hotter and let the cotton soak a half hour or more. Then follow with 2 or 3 cooler rinses. 6 6 MISC. PUBLICATION 230, U. S. DEPT. OF AGRICULTUREwith the natural dyestuffs are alum, chrome (potassium dichromate), copperas (ferrous sulphate), and tannic acid or some other source of tannin such as oak galls or sumac leaves. Commercial dyers use oils and other substances too difficult for the home dyer to apply.By using different mordants, a variety of shades and sometimes even different colors may be obtained from one dye. For example, on wool, dahlia flowers used with a chrome mordant give an orange color and with alum a light yellow. Cochineal mordanted with alum gives a red and with chrome a purple.Both wool and silk have the property of holding chemicals in their fibers. For example, when wool is boiled in a solution of potassium dichromate (chrome mordant) a certain amount of chromium oxide is held in the fiber, and the dyestuff then combines with this mordanted wool to form a permanent color. Cotton and the other vegetable fibers do not absorb the metallic mordants so readily as wool. However, they combine well with tannic acid, which is used either as a mordant itself or as an agent for fixing metallic mordants in the fibers. 4 ounces potash alum. 1 ounce cream of tartar. Dissolve the alum and cream of tartar in 4 to 4K gallons of cold, soft water and immerse the wool yarn or cloth after it has been thoroughly wet and squeezed out of water. Heat gradually to boiling, stirring and turning the wool all the time. Boil gently for 1 hour. As the water boils away, add more so that the proportion of liquid to wool remains the same. Cool and allow the wool to stand overnight in the mordant. In the morning squeeze it from this bath, roll in a dry towel, and put in a cool place. Rinse the mordanted material well just before putting it into the dye bath. Dissolve the potassium dichromate in 4 to 4% gallons of cold, soft water and follow the directions for mordanting wool with alum. 1 ounce sodium carbonate (washing soda). Dissolve the alum and washing soda in 4 to 4 1/2 gallons of cold, soft water and immerse the cotton after it has been thoroughly wet and wrung out of water. Stir well, heat gradually, and boil for 1 hour. Cool and let stand in the bath overnight. In the morning squeeze the cotton from the mordant bath, roll in a dry towel, and put in a cool place. Rinse the mordanted material well just before putting it into the dye bath. 2 ounces sodium carbonate (washing soda). 10 ounces powdered oak galls, or 1 ounce tannic acid, or extract from 4 to 6 ounces dry sumac leaves. The dye recipes are arranged alphabetically by the name of the flower, bark, or other dye material. 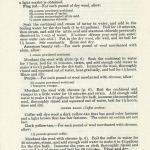 To avoid repetition in the recipes, under the heading Barks are grouped the four methods of dyeing with bark, followed by special information about each kind. 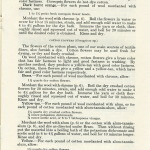 All the recipes are based on 1 pound of wool or cotton weighed while dry before it is mordanted. The dye materials must be weighed or measured, prepared as the dye recipe directs, and strained into the water for the dye bath. Use plenty of water (filtered rain water), at least 4 to 4% gallons for each pound of yarn or cloth. Otherwise the material will be crowded and will come out streaked or spotted. Rinse the mordanted yarn or fabric well, squeeze lightly, then quickly immerse it in the dye bath. Stir and turn it so that all parts are heated evenly. Be sure to keep the goods well opened oat and in constant motion. The temperature of the dye bath must be just lukewarm when wool is put in, but for cotton it can be warmer. Then heat gradually and simmer or boil according to the directions. As the dye bath boils down, lift out the yarn or cloth and add boiling water from time to time. The quantity of dye bath should be kept the same throughout the process. Rinse the dyed yarn or fabric first in water of the same temperature as the dye bath and finally in cooler water. Keep rinsing, using plenty of water until the rinse water is clear. Crocking or rubbing of the dye from the material is usually caused by insufficient rinsing. Squeeze or press out as much water from the dyed material as possible. Do not twist or wring it, for this causes streaks and wrinkles that are difficult to remove. Roll the material for a few minutes in a clean cloth or towel to absorb any excess moisture; then shake it well and hang in the shade. 8 8 MISC. PUBLICATION 230, U. S. DEPT. OF AGRICITLTTJKEWhen the fabric is dry enough to iron, cover it with a cloth and press on the wrong side.Dye the amount of yarn or cloth of each color needed for a piece of handicraft work at one time, instead of trying to match the color by a second dyeing. Vegetable dye materials vary so much that it is almost impossible to duplicate colors exactly.To obtain colors lighter or darker than those suggested by the recipes, decrease or increase the given quantities of dyestuffs. Many craft workers find it easier and pleasanter to dye their materials out of doors. 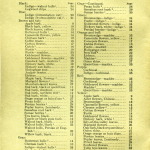 The following plant materials, sometimes suggested for dyeing, do not produce fast colors on wool or cotton and therefore are not included in the dye recipes: Annatto seeds, Japanese barberry root, beets, crab-apple peelings, the fruit of the blackberry, blueberry, cranberry, and pokeweed, purple iris flowers, mosses, peach leaves, red roses, sumac leaves, turmeric, and willow leaves. The color principles, caliistephin and asterin, are found in asters, especially the deep purple-red flowers. The asters used in testing this recipe were rose-pink. On chrome mordanted wool they gave a light greenish yellow which has good color fastness. Yz bushel fresh aster flowers. Mordant the wool with chrome (p. 6). Cut the flowers into small pieces, boil for 10 minutes in water to cover, strain, and add enough water for the dye bath (4 to 4K gallons). Immerse the wool, thoroughly rinsed and squeezed out of water, boil for 20 minutes, then rinse and dry. The barks of many common trees supply coloring materials for yarns and cloth. Of the barks discussed here, black, or quercitron, oak has the greatest coloring power. Barks produce colors on wool varying from light tan to brown, but on cotton only the lighter shades are obtained. In addition to those reported (pp. 9 to 13) white ash bark, madrone, silver maple, willow oak, and sweetgam bark were also tested, but they are omitted from this publication because their colors are very similar to those of other barks. Most barks are best collected in the fall or winter, though the resinous kinds may be gathered in the spring. Generally the inner bark is used and it may be either fresh or dried, but usually fresh ones give a stronger dye. They must be carefully dried and stored where they will not become damp and moldy. The coloring principles of these dyes are closely combined with tannin. Because of this tannin fabrics dyed with bark extracts are often not fast to light but soon darken and become brown. To prevent this change the yarn or fabric after it is dyed can be treated with certain chemicals such as potassium dichromate, ferrous sulphate, and copper sulphate. These tend to fix or remove the excess tannin. Dye methods 2, 3, and 4 (p. 9) use this process. 9 9Dye method 1.—For each pound of wool yarn or cloth not mordanted or mordanted with alum or with chrome, or for each pound of cotton yarn or cloth mordanted with alum or with alum-tannin-alum., use:1 peck finely chopped bark.Mordant the wool (p. 6) or cotton (p. 6). Soak the bark overnight in 2 to 2% gallons of soft water. In the morning heat slowly and boil for 2 hours, adding hot water to replace what boils away. Strain twice through cheesecloth and to this dye extract add enough cold water to make 4 to 4^ gallons for the dye bath. Let it cool until lukewarm, then immerse the material, which has been thoroughly rinsed and squeezed out of water, and boil for 30 minutes. Rinse and dry. 1 peck finely chopped bark. Y& ounce acetic acid, or 6 to 7 tablespoons vinegar. 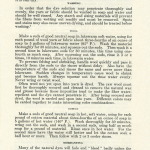 Mordant the wool with alum (p. 6) or the cotton with alum or alum-tannin-alum (p. 6). Soak the bark overnight in 2 to 2% gallons of soft water. In the morning heat slowly and boil for 2 hours, adding hot water to replace what boils away. Strain twice through cheesecloth and to this dye extract add enough cold water to make 4 to 4% gallons for the dye bath. Let it cool until lukewarm, then immerse the material, which has been thoroughly rinsed and squeezed out of watej, and boil for 30 minutes. Without rinsing, put the yarn or cloth into a boiling bath of the potassium dichromate and acetic acid in 4 gallons of soft water, stir carefully, and boil for 10 minutes. Rinse and dry. 1/2 ounce copper sulphate (blue vitriol). 1/2 ounce acetic acid, or 6 to 7 tablespoons vinegar. Mordant the wool (p. 6) and dye as directed in dye method 2, using copper sulphate in place of potassium dichromate. Ye ounce ferrous sulphate (copperas). 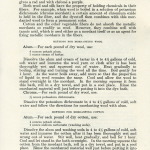 Mordant the wool (p. 6) and dye as directed in dye method 2, using ferrous sulphate in place of potassium dichromate and acetic acid or vinegar. On wool, apple bark gives a dark yellow-tan and a brass color with fair fastness to light and good fastness to washing. Dark yellow-tan.—Wool: Alum mordant (p. 6); dye method 1 or 4 (p. 9). Brass.—Wool: Chrome mordant (p. 6); dye method 1 (p. 9). 10 10 MISC. PUBLICATION 230, U. S. DEPT. OF AGRICULTURE BIRCH BARK, YELLOW (Betula lutea)The bark used in these recipes was yellow birch, common in the Northeastern States. By one method of dyeing it gave on wool a dark yellow-tan which has fair fastness to light and good fastness to washing; by another it gave a yellow-brown which has good color fastness.Dark yellow-tan.—Wool: Alum mordant (p. 6); dye method 3(p. 9). Yellow-brown.—Wool: Alum mordant (p. 6); dye method 2 (p. 9). Chittam bark is extensively collected in Oregon and Washington States in manufacturing the drug cascara sagrada. The bark also yields a dye that colors wool a dark yellow-tan, which has fair color fastness, and a light brown that has good fastness. On cotton, chittam bark gives a good fast tan and a gray with fair color fastness. Use one-fourth of a peck of chittam bark to 1 pound of wool or cotton. Dark yellow-tan.—Wool: Chrome mordant (p. 6); dye method 1 (p. 9). Light brown.—Wool: Alum mordant (p. 6); dye method 2 (p. 9). Tan.—Cotton: Alum-tannin-alum mordant (p. 6); dye method 2 (p. 9). Gray.—Cotton: Alum-tannin-alum mordant (p. 6); dye method 4 (p. 9). Hemlock bark is commonly used as a dye and tanning material. The species used in these recipes was western hemlock, which grows in hilly and rocky wooded areas of the western part of the United States. The eastern hemlock (Tsuga canadensis), commonly called spruce pine, is also used in dyeing. On wool, hemlock bark produces dark shades of yellow-tan and rose-tan, both with fair color fastness. On cotton, hemlock bark gives a rose-tan that has fair fastness to light and good fastness to washing. Dark yellow-tan.—Wool: Chrome mordant (p. 6); dye method 2 (p. 9). Dark rose-tan.—Wool: Alum mordant (p. 6); dye method 2 (p 9). 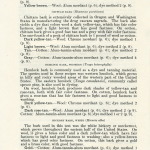 Cotton: Alum-tannin-alum mordant (p. 6); dye method 1 or 2 (p. 9). The bark used in this test was the white hickory or mockernut, which grows throughout the eastern half of the United States. On wool, it gives a brass color and a dark yellow-tan which have fair fastness to light and good fastness to washing; also a yellow-brown which has good color fastness. On cotton, this bark gives a gold and a brass color, with good fastness. 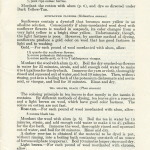 Gold.—Cotton: Alum-tannm-alum mordant (p. 6); dye method 1 (p. 9). Brass.—Wool: Chrome mordant (p. 6); dye method 1 (p. 9). 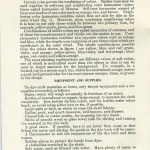 Cotton: Alum-tannin-alum mordant (p. 6); dye method 2 (p. 9). Dark yellow-tan.—Wool: Alum mordant (p. 6); dye method 3 (p. 9). 11 HOME DYEING WITH NATURAL DYES 11maple bark, Norway (Acer platanoides).By one method of dyeing on wool, Norway maple bark produces a rose-tan; by another method, a light brown. Both have fair fastness to light and good fastness to washing. On cotton, this bark gives a light gray which has fair fastness to light and good fastness to washing; and a drab, which has good color fastness. The bark of the silver maple, which grows throughout eastern North America, produces similar colors on wool and cotton.Rose-tan. — Wool: Alum mordant (p. 6); dye method 3 (p. 9). Wool: Chrome mordant (p. 6); dye method 1 (p. 9). . Light brown. — Wool: Alum mordant (p. 6); dye method 2 (p. 9). Light gray. — Cotton: Alum- tannin-alum mordant (p. 6); dye method 1 (p. 9). Drab. — Cotton: Alum-tannin-alum mordant (p. 6); dye method 2 (p. 9). Quercitron is the dyestuff prepared from the inner bark of black or quercitron oak trees, found in the eastern half of the United States, especially in Pennsylvania, Georgia, and the Carplinas. 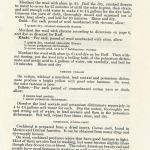 The bark itself may be used, or a pure dye extract of quercitron may be purchased. The extract has much greater coloring power than the bark. The following directions are for the use of the quercitron extract. If the bark is used instead of the extract, follow dye method 1, chrome mordant (p. 9), or method 2 (p. 9). Since tannin dulls the brilliancy of colors, prolonged boiling in a quercitron dye bath must be avoided. On wool, quercitron produces a gold color with good fastness to light and to washing, and a yellow-tan that has fair fastness to light and good fastness to washing. On cotton, quercitron gives a gold color which has good color fastness. Mordant the wool with chrome (p. 6). Dissolve the quercitron extract in enough soft water for the dye bath (4 to 4% gallons), immerse the yarn or cloth thoroughly rinsed and squeezed out of water, and boil for 30 minutes. Rinse and dry. yg ounce acetic acid, or 6 to 7 tablespoons vinegar. Mordant the cotton in alum-tannin-alum according to directions on page 6. Dissolve the quercitron in 4 to 4% gallons soft water for the dye bath, immerse the goods, thoroughly rinsed and squeezed out of water, and boil for 30 minutes. Without rinsing, put the material into a boiling bath of the potassium dichromate and acetic acid. Stir carefully, and boil for 10 minutes. Rinse and dry. Ys ounce acetic acid, or 6 to 7 tablespoons vinegar. Mordant the wool in alum (p. 6) and dye as for Gold, method 2. 12 12 MISC. PUBLICATION 230, U. S. DEPT. OF AGRICULTUREoak bark, chestnut (Quercus montana)The chestnut oak is native to the eastern part of the United States from Maine to Alabama. On wool, chestnut-oak bark produces a dark yellow-tan which has fair fastness to light and good fastness to washing, and a light brown which has good color fastness.Yellow-tan.—Wool: Chrome mordant (p. 6); dye method 1 (p. 9). Northern red oak trees are found throughout the eastern half of the United States. On wool, this bark gives a rose-tan which has fair color fastness; also a tan, a yellow-tan, and a light brown, which have good color fastness. On cotton, a rose-tan is obtained with fair fastness to light and good fastness to washing. Tan.—Wool: Chrome mordant (p. 6); dye method 3 (p. 9). Rose-tan.—Wool: No mordant; dye method 1 (p. 9). 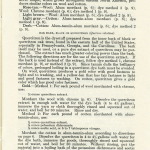 Cotton: Alum mordant (p. 6); dye method 2 (p. 9). Yellow-tan.—Wool: Chrome mordant (p. 6); dye method 1 (p. 9). The bark of the white oak, which grows in the eastern half of the United States, produces on wool a dark yellow-tan, a light brown, and a khaki color. The color fastness is good. 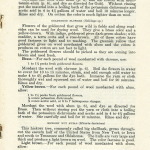 Dark yellow-tan.—Wool: Alum mordant (p. 6); dye method 1, 3, or 4 (p. 9). Khaki.—Wool: Chrome mordant (p. 6); dye method 1 (p. 9). The bark of the tupelo, or black gum, common in the eastern half of the United States, produces on wool a dark yellow-tan and a khaki color. Both colors have fair fastness to light and good fastness to washing. Dark yellow-tan.—Wool: Alum mordant (p. 6); dye method 1 or 3 (p. 9). Khaki.—Wool: Alum mordant (p. 6); dye method 2 (p. 9). On wool, black walnut bark gives a khaki color which has fair fastness to light and good fastness to washing. A yellow-brown and a dark brown also are obtained, which have good color fastness. Yellow-brown.—Wool: Alum mordant (p. 6); dye method 3 (p. 9). Dark brown.—Wool: Alum mordant (p. 6); dye method 2 (p. 9). The black willow tree is native to the eastern part of North America. On wool, black willow bark produces a rose-tan and a light brown. Both have fair fastness to light and good fastness to washing. 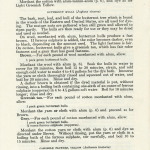 13 HOME DYEING WITH NATURAL DYES 13Rose-tan.—Wool: Alum mordant (p. 6); dye method 1 or 3 (p. 9). Light brown.—Wool: Alum mordant (p. 6); dye method 2 (p. 9).BIRCH LEAVES, YELLOW (Betuld lutea)Yellow birch is one of the most valuable forest trees of the Northern States. On wool, its leaves produce a yellow-tan that has fair fastness to light and good fastness to washing. The leaves can be used either fresh or dry; if the leaves are fresh, use twice the quantity stated below. % peck dry birch leaves. 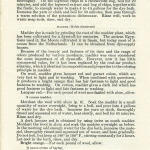 Mordant the wool with ahim (p. 6). Soak the leaves overnight in enough water to cover. In the morning boil for 1 hour, strain, and add water to make 4 to 4% gallons for the dye bath. Immerse the wool material thoroughly rinsed and squeezed out of water and boil for 30 minutes. Rinse and dry. Broomsedge or “dyer’s broom” grows on open waste ground from Massachusetts to Illinois and south to Florida and Texas. The entire stalk and leaves are used for dyeing. Gathered at any time of year it will color but the dye is stronger in the summer when the plant is green. It can be cut in June and July, dried, and used as needed. On wool, broomsedge gives a light greenish yellow and a brass color; and on cotton, a yellow and a gold. All have good color fastness except the yellow and it has fair fastness to light. Broomsedge can be used with indigo to give shades of green and with madder to give henna and a brick color. % ounce acetic acid, or 6 to 7 tablespoons vinegar. Mordant the wool with alum (p. 6). Cut up the dry broomsedge, steep in water to cover, and boil for 20 minutes. Strain and add enough cold water to make 4 to 4}£ gallons for the dye bath. Immerse the yarn or cloth thoroughly rinsed and squeezed out of water and boil for 20 minutes. Without rinsing put in a boiling bath of the copper sulphate and acetic acid in 4 gallons of water, stir carefully, and boil for 10 minutes. Rinse and dry. Mordant the wool with chrome (p. 6). Cut up the dry broom-sedge, steep in water to cover, and boil for 20 minutes. Strain and add enough cold water to make 4 to 4% gallons for the dye bath. Immerse the yarn or cloth thoroughly rinsed and squeezed out of water and boil 20 minutes. Rinse and dry. 14 14 MISC. PUBLICATION 230, U. S. DEPT. OF AGRICULTUREMordant the cotton with alum-tannin-alum (p. 6) and dye as directed under Brass.Gold.—For each pound of cotton mordanted in alum-tannin-alum, allow:% peck dry broomsedge. Mordant the cotton with alum-tannin-alum (p. 6), and dye as for Light Greenish Yellow. The bark, root, leaf, and hull of the butternut tree which is found in the woods of the Eastern and Central States, are all used for dyeing. The mature nuts are gathered when still green and allowed to ripen partly. The hulls are then ready for use or they may be dried and used as needed. On wool, mordanted with alum, butternut hulls produce a fast brown. If ferrous sulphate is added, the color becomes darker, even to black, depending on the amount used. The light fastness is fair. On cotton, butternut hulls give a greenish tan, which has fair color fastness and a gray that has good fastness. Brown.—For each pound of wool mordanted with alum, allow: 1 peck green butternut hulls. Mordant the wool with alum (p. 6). Soak the hulls in water to cover for 30 minutes, then boil 15 to 30 minutes, strain, and add enough cold water to make 4 to 4K gallons for the dye bath. Immerse the yarn or cloth thoroughly rinsed and squeezed out of water, and boil for 30 minutes. Rinse and dry. A darker brown is obtained if the dyed material is put, without rinsing, into a boiling bath containing one-sixth of an ounce of ferrous sulphate (copperas) in 4 to 4% gallons soft water. Boil for 10 minutes longer; rinse and dry. 1 peck green butternut hulls. Mordant the yarn or cloth with alum (p. 6) and proceed as for Brown. % ounce ferrous sulphate (copperas). Mordant the cotton yarn or cloth with alum (p. 6) and dye as directed under Brown. Without rinsing, put the yarn or cloth in a boiling bath of the ferrous sulphate, stir carefully, and boil 10 to 15 minutes. Rinse and dry. Yellow camomile flowers, or golden marguerites as they are sometimes called, are becoming frequent in fields and waste places of this country. The flowers come late in the summer and either fresh or dried may be used for dyeing. 15 On wool mordanted with alum, camomile flowers give a buff color which on washing in soapsuds becomes brighter. It has fair color fastness. By other methods of dyeing, gold and khaki colors of good fastness to light and to washing are obtained. Camomile flowers do pot dye cotton.Buff.—For each pound of wool mordanted with alum, allow:7 quarts dry, crushed camomile flowers.Mordant the wool with alum (p. 6). Boil the dry, crushed flowers in water to cover for 25 minutes or until the color is gone, then strain, and add enough cold water to make 4 to 4% gallons for the dye bath. Immerse the yarn or cloth, thoroughly rinsed and squeezed out of water, heat slowly, and boil for 30 minutes. Rinse and dry. Gold.—For each pound of wool mordanted with chrome, allow: 7 quarts dry, crushed camomile flowers. Mordant the wool with chrome according to directions on page 6, and dye as directed for Buff. 7 quarts dry, crushed camomile flowers. Mordant the wool with alum (p. 6) and dye as for Buff. Then without rinsing, put the wool into a boiling bath of the potassium dichromate and acetic acid in 4 gallons of water, stir carefully, and boil for 10 minutes. Rinse and dry. On cotton, without a mordant, lead acetate and potassium dichromate produce a bright yellow with good color fastness. On wool, the color fastness is poor. Dissolve the lead acetate and potassium dichromate separately in 4 to 4K gallons soft water for each. Dip the cotton, thoroughly wet and wrung out of water, in lead acetate and then in the potassium dichromate. Stir well, repeat four times; rinse, and dry. Cochineal is prepared from a dried insect, Coccus cacti, found in Mexico and Central America. It can be obtained from many drug- and dye-supply houses. On wool, cochineal produces colors that have good fastness to light. Most of them are also fast to washing, but some become slightly bluer though they do not run or bleed. The colors American beauty red and purple have good fastness to washing as well as good fastness to light. 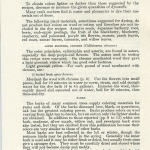 Cochineal is not a satisfactory dye for cotton. 1 ounce powdered cochineal. 4 ounces oxalic acid. 4 ounces stannous chloride. 1 ounce cream of tartar. 3 1/2j ounces powdered cochineal. 3 1/2 ounces cream of tartar. 1 1/2 ounces concentrated nitric acid. Soak the cochineal and cream of tartar in water, and add to the boiling water for the dye bath (4 to 4% gallons). Boil for 10 minutes, then strain, and add the nitric acid and stannous chloride previously dissolved in 1 cup of water. (Caution: Always pour acid into water; never water into acid.) Put in the dry wool, stir well, and let boil for \% hours. Stir constantly. Rinse and dry. Mordant the wool with alum (p. 6). Soak the cochineal in water for 1 hour, boil for 15 minutes, strain, and add enough cold water to make 4 to 4K gallons for the dye bath. Immerse the wool, thoroughly rinsed and squeezed out of water, heat gradually, and boil for 1 % hours. Rinse and dry. ly-z ounces powdered cochineal. 1 teaspoon vinegar. Mordant the wool with chrome (p. 6). Boil the cochineal and vinegar in a little water for 10 minutes and strain. Add enough cold water to make 4 to 4}£ gallons for the dye bath, immerse the mordanted wool, thoroughly rinsed and squeezed out of water, boil for 1 % hours, rinse and dry. Coffee will dye wool a dark yellow-tan that has good color fastness and a light brown that has fair fastness. The colors on cotton are not fast. Mordant the wool with chrome (p. 6). Boil the coffee in water for 20 minutes, strain, and add enough cold water to make 4 to 4K gallons for the dye bath. Immerse the yarn or cloth thoroughly rinsed and squeezed out of water and boil for 30 minutes. Rinse and dry. 17 HOME DYEING WITH NATURAL DYES 17ferrous sulphate in 4 gallons of water, stir carefully, and boil for 10 minutes. Rinse and dry.cokbopsis floweks (Coreopsis sp. )The coreopsis, commonly called the “yellow dye flower”, is widely used in coloring yarns and fabrics for handicraft purposes. On wool, the flowers produce ‘a dark burnt orange or terra cotta, which has good color fastness. Coreopsis flowers do not dye cotton. 1 to 1% pecks fresh coreopsis flower heads. Mordant the wool with chrome (p. 6). Boil the flowers in water to cover for 10 or 15 minutes, strain, and add enough cold water to make 4 to 4% gallons for the dye bath. Immerse the yarn or cloth, thoroughly rinsed and squeezed out of water, and boil for 20 minutes or until the desired color is obtained. Rinse and dry. The flowers of the cotton plant, one of our main sources of textile fibers, also furnish a dye. Cotton flowers may be used fresh for dyeing, or dry and finely crushed. On wool mordanted with chrome, cotton flowers give a brass color that has fair fastness to light and good fastness to washing. By another method, they produce a yellow-tan with good color fastness. On cotton, these flowers give a yellow and a yellow-tan, which have fair and good color fastness respectively. Brass.—For each pound of wool mordanted with chrome, allow: 1% quarts dry cotton flowers. Mordant the wool with chrome (p. 6). Boil the dry crushed cotton flowers for 20 minutes, strain, and add enough cold water to make 4 to 4% gallons for the dye bath. Immerse the yarn or cloth thoroughly rinsed and squeezed out of water, and boil for 30 minutes. Rinse and dry. 1% quarts dry crushed cotton flowers. Mordant the wool with alum (p. 6) or the cotton with alum-tannin-alum (p. 6), and dye as directed under Brass. Then without rinsing put the material into a boiling bath of the potassium dichromate and acetic acid in 4 to 4% gallons of water, and boil for 10 minutes longer. Rinse and dry. 1% quarts dry cotton flowers. Mordant the cotton with alum-tannin-alum (p. 6) and dye as directed for Brass. 18 18 MISC. PUBLICATION 230, U. S. DEPT. OF AGRICULTUREcutch (Acacia sp. )Cutch or catechu, one of the most important brown vegetable dyes, is the dried extract obtained from the wood of various species of acacia growing in India, Java, and the East Indies. Cutch can be obtained from houses supplying dyes and botanical drugs.On both wool and cotton, cutch gives a fine rich brown when applied with copper sulphate and potassium dichrpmate. On cotton, its fastness to light is fair, and fastness to washing good; on wool, both are good. Boil the cutch and copper sulphate in water until well dissolved. While still hot, put in the yarn or cloth which has been boiling a short time in clear water, stir well, and let stand overnight. In the morning squeeze the material from the cutch solution and put into a hot bath made by dissolving the potassium dichromate in 4 to 4V2 gallons of soft water. Stir well and let stand in this for 45 minutes just below boiling temperature. Rinse and dry. The dahlias common in flower gardens furnish a good source of orange dye for wool. Yellow flowers give clearer and brighter colors than pink ones although their color fastness is the same. On wool mordanted with chrome, yellow dahlia flowers give an orange color that has fair fastness to light and good fastness to washing. The yellow obtained with an alum mordant has poor fastness to light. Dahlia flowers do not dye cotton. Orange.—For each pound of wool mordanted with chrome, use: 1 to 1% pecks fresh dahlia flowers. Mordant the wool with chrome (p. 6). Cut the flowers up and boil in water to cover for 10 to 15 minutes, strain, and add enough cold water to make 4 to 4% gallons for the dye bath. Immerse the yarn or cloth thoroughly rinsed and squeezed out of water, and boil for 20 minutes. Rinse and dry. Fustic is probably one of the best yellow dyes found in nature. It is obtained from the wood of a tree that grows in Mexico, Cuba, and Nicaragua. It can be purchased either as wood chips or as an extract. On wool, fustic produces a gold color and a dark yellow-tan. On cotton, it gives a lighter yellow-tan. All have good color fastness. The colors with alum and tin mordants are brighter but their fastness is poor. 19 HOME DYEING WITH NATURAL DYES 19minutes. Rinse and dry. Prolonged boiling should be avoided as this causes the color to become dull and brown.Yellow-tan.—For each pound of wool mordanted with alum, or for each pound of cotton mordanted with alum-tannin-alum, allow:% ounce fustic extract. % ounce acetic acid, or 6 to 7 tablespoons of vinegar. Mordant the wool with alum (p. 6) and the cotton with alum-tannin-alum (p. 6), and dye as directed for Gold. Without rinsing put the material into a boiling bath of the potassium dichromate and acetic acid in 4 to 4l/2 gallons of water and boil 10 minutes longer. Rinse and dry. On cotton the color is much lighter than on wool. Flowers of the goldenrod that grow wild in fields and along roadsides can be used for dyeing wool. They give a brass color and a yellow-brown. With indigo, goldenrod gives dark-green shades; with madder, a terra cotta and a rose-brown. All of these colors have good fastness to light and to washing. The greenish yellow that goldenrod gives on wool mordanted with alum and the colors it produces on cotton are not fast to light. The goldenrod flowers should be picked as they are coming into bloom and used fresh. 1 to \Yz pecks fresh goldenrod flowers. Mordant the wool with chrome (p. 6). Boil the flowers in water to cover for 10 to 15 minutes, strain, and add enough cold water to make 4 to 4K gallons for the dye bath. Immerse the yarn or cloth thoroughly wet and squeezed out of water and boil for 20 minutes. Rinse and dry. 1 to 1% pecks fresh goldenrod flowers. Mordant the wool with alum (p. 6), and dye as directed for Brass. Then without rinsing put the yarn or cloth into a boiling-bath of the potassium dichromate and acetic acid in 4 to 4% gallons of water. Stir carefully and boil for 10 minutes. Rinse and dry. This hickory tree, commonly called big shellbark, grows throughout the eastern half of the United States from New York to Iowa and south to Tennessee and Oklahoma. The hulls are very large and thick and produce a light brown on wool. The color fastness is good. 1 peck green hickory nut hulls. % ounce potassium dichromate. Y& ounce acetic acid, or 6 to 7 tablespoons vinegar. 20 20 MISC. PUBLICATION 230, U. S. DEPT. OF AGRICULTUREboil 45 minutes, strain, and add water to make 4 to 4% gallons for the dye bath. Immerse the wool material thoroughly rinsed and squeezed out of water and boil 30 minutes. Without rinsing put in a boiling bath of the potassium dichromate and acetic acid, stir carefully, and boil for 10 minutes. Rinse and dry.hollygrape boot (Berberis sp. )The coloring matter contained in Ijollygrape root is berberine, the same as that present in the bark and root of barberry. It is one of the few natural basic dyestuffs. Hollygrape, or Oregon grape as it is sometimes called, grows in the Northwestern States. On wool, hollygrape root gives a buff and a light tan which have fair color fastness. On cotton its colors are not fast. Buff.—For each pound of wool mordanted with alum, allow: 1 peck chopped hollygrape root. Mordant the wool with alum (p. 6). Soak the chopped root overnight in water to cover. In the morning boil for 2 hours, strain, and add enough water to make 4 to 4% gallons for the dye bath. Immerse the yarn or cloth thoroughly rinsed and squeezed out of water ‘and boil for 30 minutes. Rinse and dry. 1 peck chopped hollygrape root. l/& ounce potassium dichromate. % ounce acetic acid, or 6 to 7 tablespoons vinegar. Mordant the wool with alum (p. 6) and dye as directed above. Without rinsing put into a boiling bath of the potassium dichromate and acetic acid, stir carefully, and boil 10 minutes longer. Rinse and dry. Indigo, one of the oldest dyestuffs known, was probably first used in India and Egypt. During the sixteenth century it was introduced into Europe where it met with much opposition from the cultivators of a similar dye—woad. Indigo is still extensively used and can be obtained at many dye-supply houses. On both wool and cotton it produces a dark blue that is very fast to light and to washing. Indigo does not require a mordant. It belongs to the group of vat dyes, so called because they are applied in a special kind of dye bath called a vat. Since indigo itself is not soluble in water, it must first be changed by a reducing agent and then dissolved in alkali so that the wool or cotton fiber can take it up. The material is dyed by repeatedly dipping it in the dye vat and holding it in the air until the desired color is developed and permanently fixed in the fiber. The fermentation and hydrosulphite vats are described here. The fermentation vat or blue-pot is the oldest method of dyeing with indigo. The bacteria that develop in the vat act on the dye to reduce and change it. Although dyeing by this method is somewhat complicated, there is no difficulty in developing a good, fast dark blue on both wool and cotton if the vat is properly prepared. With fewer dips, a medium blue and a light blue are obtained. 21 HOME DYEING WITH NATURAL DYES 21Dark blue.—For each pound of wool or cotton, allow:8 ounces finely powdered indigo.4 ounces wheat bran. \% pounds sodium carbonate (washing soda). Mix ingredients and let stand in a warm place (85° F.) from 5 to 10 days until the mixture develops a disagreeable odor, a bluish, coppery scum on top, and green streaks through it. The dye is then ready to use. The blue-pot should be stirred well, each morning. 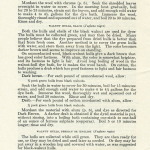 Wool yarn or cloth may be dyed in the indigo vat without a mordant, though some dyers prefer mordanting with alum (p. 6). Good results are also obtained when the wool, before being dyed, is soaked for 30 minutes in a solution of one-half ounce of washing soda to 4 gallons of lukewarm water and rinsed well. If the indigo-dyed wool is to be top-dyed with yellow it is advisable to mordant with alum either before or after dying with indigo. Cotton yarn or cloth is also dyed without a mordant, though sometimes it is mordanted with alum (p. 6). Another method of preparing cotton for dyeing is to boil it for 30 minutes in a solution of one-half ounce of sodium hydroxide to 4 gallons of water, and rinse well. To dye with the indigo vat, first wet the wool or cotton thoroughly, then dip it in the vat, which should be kept lukewarm, stir well, and lift the fabric out into the air at intervals. The cloth will be greenish yellow in the dye vat but on being taken out in the air, will soon develop the blue color. Continue the dipping and airing for 30 minutes, then squeeze out the dye, and air for half an hour. Repeat this process several times, increasing the time of immersion of the cloth in the dye until the desired color is obtained. Also turn and stir the material in the dye occasionally to insure an even color. When the color is dark enough, rinse the material in lukewarm water and dry. Fewer dippings will give a medium blue and a light blue. Take care not to disturb the sediment in the vat, or the fabrics will be streaked and unevenly dyed. Also do not stir the dye vat too much, or it will turn blue and no longer be fit for dyeing. In case it does become blue, the vat can be renewed by adding more indigo, bran, madder, and sodium carbonate. After standing for a day or two, it will be ready to use again. In this way the blue-pot is kept going and can be used many times. 4% ounces powdered indigo. 3 ounces sodium hydroxide. 2% ounces sodium hydrosulphite. Heat the water for the dye vat to 120° F., add the half cup of sodium hydrosulphite solution, stir well, and let stand for 10 minutes. Then add the indigo hydrosulphite stock solution, stir gently, and allow to stand for 20 minutes. The vat is then ready to use for dyeing. The liquor should be clear and yellow in color. Both wool and cotton are dyed in the hydrosulphite vat without mordants. 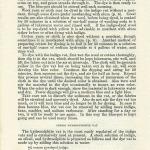 In case the material is to be top-dyed with another color, it is advisable to mordant with alum (p. 6) either before or after dyeing with indigo. However, this depends on the dye that is to follow. To dye with this vat, first wet the cloth well, then dip it in the vat, and stir occasionally for 30 minutes, always keeping the material well covered with the dye. Without squeezing or rinsing, hang it in the air for 30 minutes, then dip again in the vat. Continue this dipping and airing until the desired color is obtained, then rinse thoroughly, wash in soapsuds, and rinse again. If the vat turns blue, add more sodium hydrosulphite solution, stir the vat carefully, and let stand for 15 minutes before using. Also add more of the indigo hydrosulphite stock solution as needed. On cotton without a mordant, ferrous sulphate produces a buff color that has fair fastness to light and washing. On wool the fastness to light is poor. 6 ounces ferrous sulphate (copperas). 6 ounces powdered soap. Dissolve the ferrous sulphate in 4 to 4K gallons of water, put in the cotton, thoroughly wet and squeezed out of water, stir for a few minutes, remove, and drain. Then dip it into soapsuds, stir, and wring. Repeat three times; then rinse and dry. Juniper, also called red cedar, grows in many sections of the United States. The bark, berries, and twigs are suitable for dyeing purposes. On wool, juniper berries give a khaki color when applied with alum and copper sulphate. It is fast to light and to washing. Juniper berries do not dye cotton. 2 quarts ripe juniper berries. 2 ounces potash alum. % ounce ammonium chloride. 1 ounce cream of tartar. 1 ounce copper sulphate. 1 ounce copper acetate. 23 HOME DYEING WITH NATURAL DYES 23Dissolve the alum, ammonium chloride, cream of tartar, and copper sulphate in 4 to 4% gallons of soft water. Put in the wool, wet thoroughly and squeezed out of water, boil for 1 hour, and let stand in this mordanting liquor until cold, then rinse. Break up the berries, tie in a cheesecloth bag, soak in water overnight, then boil for 1 hour and add enough cold water for the dye bath. Immerse the mordanted wool in this dye extract, boil for 1 to 2 hours, and remove. Add the copper acetate to the dye bath and when dissolved, return the yarn or cloth, and boil for 15 to 30 minutes longer. Rinse and dry.LICHENSThe peasant dyers of Sweden, Scotland, and Ireland use lichens for coloring woolens various shades of brown, yellow, red, and purple. August is probably the best month to collect dye lichens, when they contain the most acid and the colors are stronger and clearer. It is said that lichens growing on stones give a better color than the same lichens growing on trees. Lichens of the genus Peltigera are flat and leaf like. They grow on rocks and on trees and are very abundant in all parts of North America, especially in the mountains of the South. The lichens used for these tests on wool gave a yellow-tan and a dark rose-tan. Both have fair fastness to light and good fastness to washing. Yellow-tan.—For each pound of wool mordanted with alum, allow: 1 peck crushed dry lichens. Mordant the wool with alum (p. 6). Soak the lichens overnight in water to cover; in the morning heat gradually and boil for 1 hour. Strain and add cold water to make 4 to 4% gallons for the dye bath. Immerse the wool thoroughly rinsed and squeezed out of water, and boil for 30 minutes. Rinse and dry. 1 peck crushed dry lichens. This branched, hairlike lichen grows on barks, rarely on rocks, and is broadly distributed over the entire world. On wool it gives a buff color, a yellow-tan, and a dark rose-tan, all with good color fastness. 1% to 2 pecks crushed dry lichens. Mordant the wool with alum (p. 6). Soak the dry lichens overnight in water to cover. In the morning boil for 1 hour, strain, and add enough cold water to make 4 to 4% gallons for the dye bath. 24 24 MISC. PUBLICATION 230, U. S. DEPT. OF AGRICULTUREImmerse the wool thoroughly rinsed and squeezed out of water, and boil for 30 minutes. Kinse and dry.Yellow-tan.—For each pound of wool mordanted with chrome, allow:1% to 2 pecks crushed dry lichens. Mordant the wool with chrome (p. 6) and dve as directed under Buff. \Yi to 2 pecks crushed dry lichens. Mordant the wool with alum (p. 6) and dye as for Buff. Then without rinsing put the wool in a boiling bath of the potassium dichromate and acetic acid or vinegar in 4 gallons of water and boil for 10 minutes. Rinse and dry. On wool mordanted with chrome, the fresh, young leaves of lily-of-the-valley give a light greenish yellow color. The fastness to light is fair, and the fastness to washing good. Leaves gathered in the late summer or fall give a gold color to wool mordanted with chrome. They do not dye cotton. \l/z pecks shredded fresh, young lily-of-the-valley leaves. 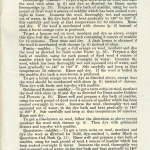 Mordant the wool yarn or cloth with chrome (p. 6). Soak the leaves in water overnight. In the morning heat slowly and boil for 1 hour, strain, and add enough cold water to make 4 to4% gallons for the dye bath. When cool, immerse the mordanted material, thoroughly rinsed and squeezed out of water, and boil for 45 minutes. Rinse and dry. Logwood, one of the most extensively used natural dyestuffs, is obtained from a tree that grows in Cuba, Jamaica, and Central America. It can be purchased from dye- and botanical-drug supply houses as wood chips or as an extract either in liquid or solid form. With various mordants it gives a wide range of colors, but their fastness to light varies considerably, and most of them fade rather rapidly. In fact, because of the fugitive character of this dye, Queen Elizabeth issued an edict prohibiting its use and directing that all logwood found should be burned. On wool the black produced with sumac and ferrous sulphate is fast to light and fast to washing. On cotton, the colors are not fast. \l/z pecks chopped sumac leaves and twigs. 25 HOME DYEING WITH NATURAL DYES 25Soak the fresh sumac leaves and twigs in water overnight. In the morning boil for 30 minutes, strain, and add enough water for the mordant bath (4 to 4% gallons). Enter the yarn or cloth, thoroughly wet and squeezed out of water, and soak overnight. The next morning, squeeze out the material, and, without rinsing, work for 10 minutes in a bath of the sodium carbonate at 120° to 140° F. Then squeeze out the wool and work in a cool solution of ferrous sulphate for 30 minutes. Keturn to the soda bath for 15 minutes and rinse thoroughly. Tie the logwood chips in a cheesecloth bag, boil for 20 minutes, and add the logwood extract and bag of chips, together with the fustic, to enough water to make 4 to 4K gallons for the dye bath. Immerse the yarn or cloth and boil for 30 minutes, then pass through a warm solution of the potassium dichromate. Rinse well, work in warm soap suds, rinse, and dry.madder (Rubia tinctorurri)Madder dye is made by grinding the root of the madder plant, which has been cultivated for a dyestuff- for centuries. The ancient Egyptians used it, the Moors cultivated it in Spain, but today most of it comes from the Netherlands. It can be obtained from dye-supply houses. Because of the beauty and fastness of its tints and the range of colors produced by various mordants, madder was once considered the most important of all dyestuffs. However, now it has little commercial value, for it has been replaced by the coal-tar product alizarine, which is identical in composition and properties to the coloring principle in madder. On wool, madder gives lacquer red and garnet colors, which are very fast to light and to washing. When combined with quercitron, it produces a bright orange that has fair fastness to light and good fastness to washing. On cotton, madder gives a dark red which has good fastness to light and fair fastness to washing. Lacquer red.—For each pound of wool mordanted with alum, allow: 8 ounces madder. Mordant the wool with alum (p. 6). Soak the madder in a small quantity of water overnight, bring to a boil, and pour into 4 gallons of water for the dye bath. Immerse the yarn or cloth, thoroughly rinsed and squeezed out of water, heat slowly, and boil for 45 minutes. Rinse and dry. A dark lacquer red is obtained by using twice as much madder. Mordant the wool in alum and soak the madder overnight as before. In the morning add enough water for the dye bath, immerse the material, thoroughly rinsed and squeezed out of water, and heat gradually. Do not boil, but keep at 140° to 160° F., stirring constantly for 2 hours. Let cool in the bath, rinse, and dry. % ounce cream of tartar. 1 ounce stannous chloride. Yz ounce quercitron extract. lYz ounces madder. 26 26 MISC. PUBLICATION 230, U. S. DEPT. OF AGRICULTUKEmove the material, add the quercitron, madder, and the remainder of the stannous chloride, and stir well until dissolved. Return the wool to the bath, stir carefully, and boil for 30 minutes. Rinse and dry.Garnet red.—For each pound of wool mordanted with chrome, allow:8 ounces madder. Mordant the wool with chrome (p. 6) and dye as directed under Lacquer Red. Mordant the cotton with alum-tannin-alum, (p. 6). First dye bath: Prepare a dye bath from 2 ounces of the madder that has been soaked overnight, immerse the cotton, thoroughly rinsed and wrung out of water, stir carefully, and heat until lukewarm. Keep stirring and hold at a lukewarm temperature for 1 hour. Then let the dye bath cool and the material stand overnight in the dye bath. Second dye bath: Repeat the entire process of the first dye bath using, this time, 3 ounces of madder which has been soaked overnight. Stir well, cool gradually, and let stand in the dye bath overnight. Rinse and dry. Third dye bath: Repeat the process described for the second dye bath, using the rest of the madder. Rinse well and finally wash in soapsuds and rinse again. The coloring matter in the flower of the garden marigold is similar to that in black or quercitron oak bark. On wool, marigold flowers produce a brass color and a dark yellow-tan, both having good fastness to light and to washing. On cotton, they give a yellow-tan that has fair color fastness. Either fresh or dry flowers may be used. If dry, use about one-third to one-half the quantity recommended here. Brass.—For each pound of wool mordanted with chrome, allow: 1 to \Yz pecks fresh marigold flower heads. Mordant the wool with chrome (p. 6). Boil the flowers in water to cover for 10 to 15 minutes, strain, and add enough cold water to make 4 to 4}£ gallons for the dye bath. Immerse the yarn or cloth thoroughly rinsed and squeezed out of water and boil for 20 minutes. Rinse and dry. Yellow-tan.—For each pound of wool mordanted with alum, or for each pound of cotton mordanted with alum-tannin-alum, allow. 1 to \Yz pecks fresh marigold flower heads. Ye ounce acetic acid, or 6 to 7 tablespoons vinegar. Mordant the wool with alum (p. 6) and the cotton with the alum-tannin-alum (p. 6). Dye as directed for Brass. Without rinsing, put the fabric or yarn into a boiling bath of the potassium dichromate and acetic acid, or vinegar, and boil for 10 minutes longer. Rinse and dry. The yellow-tan is much darker on wool than on cotton. 27 HOME DYEING WITH NATUEAL DYES 27 MOUNTAIN-LAUKEL LEAVES (Kalmia Idtifolio)On wool, mordanted with chrome, mountain-laurel leaves produce a 3>-ellow-tan. The fastness to light is fair, and to washing good. Mountain-laurel leaves do not dye cotton.Yellow-tan.—For each pound of wool mordanted with chrome, use:\l/2 pecks shredded fresh mountain-laurel leaves. Mordant the wool with chrome (p. 6). Soak the shredded leaves overnight in water to cover. In the morning boil for 20 minutes, strain the dye liquor, and add enough water to make 4 to 4% gallons for the dye bath. When cool, immerse the mordanted yarn or cloth, thoroughly rinsed and squeezed out of water, and boil for 30 minutes. Rinse and dry. The dry outer skins of onion bulbs have long been used for coloring fabrics. On wool, the Yellow Globe onion gives a burnt orange and a brass color. The color fastness of the orange is fair, and of the brass color fair to light and good to washing. On cotton, the color fastness is poor. 10 ounces dry Yellow Globe onion skins. 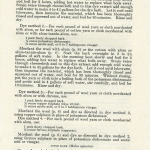 Mordant the yarn or cloth with alum (p. 6). Boil the onion skins in water to cover for 15 minutes, strain, and add enough cold water to make 4 to 4% gallons for the dye bath. Immerse the material, thoroughly rinsed and squeezed out of water, stir carefully, and boil for 30 minutes. Rinse and dry. Brass.—Use yarn or cloth mordanted with chrome (p. 6) and proceed as for Burnt Orange. 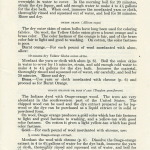 The Indians dyed with Osage-orange wood. The trees are very abundant in the southwestern part of the United States. The chipped wood can be used and the dye extract prepared as for logwood or the dye can be purchased as a liquid extract or in solid or powdered form. On wool, Osage orange produces a gold color which has fair fastness to light and good fastness to washing, and a yellow-tan with good color fastness. On cotton it gives a light yellow-tan which has good color fastness. Mordant the wool with chrome (p. 6). Dissolve the Osage-orange extract in 4 to 4% gallons of water for the dye bath, immerse the yarn or cloth, thoroughly rinsed and squeezed out of water, and boil for 30 minutes. Rinse and dry. J4 ounce acetic acid, or 6 to 7 tablespoons vinegar. 28 28 MISC. PUBLICATION 230, U. S. DEPT. 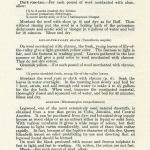 OF AGRICULTUREMordant the wool with alum (p. 6) or the cotton with alum-tannin-alum (p. 6) and dye as directed for Gold. Then, without rinsing, put the yarn or cloth in a boiling bath of the potassium dichromate and acetic acid, or vinegar, in 4 gallons of water. Stir carefully and boil for 10 minutes. Rinse and dry.pecan hulls (Hicoria pecan)Pecan trees grow in Iowa, Indiana, and the Southern States. On wool, pecan hulls produce a brown which has fair fastness to light and washing. On cotton, they give a dark gray with fair color fastness. % peck green pecan hulls. Mordant the wool with alum (p. 6). Cut the hulls from the nuts and boil in water for 15 minutes. Strain, add enough cold water to make 4 to 4% gallons for the dye bath, immerse the material, thoroughly rinsed and squeezed out of water, and boil for 30 minutes. Rinse and dry. Mordant the cotton with alum (p. 6) and dye as for Brown Without rinsing, put the cotton in a boiling bath of the ferrous sulphate in 4 gallons of water, stir carefully, and boil for 10 minutes. Rinse and dry. Persian berries, also known as yellow berries or French berries, are grown in France, Spain, Italy, and Persia. Either the dried berries or an extract can be bought from dye- and botanical-drug supply houses. On wool, Persian berries give a gold color and a dark yellow-tan; and on cotton, a lighter yellow-tan. All three have good color fastness. y-i ounce Persian berry extract. Mordant the wool with chrome (p. 6). Dissolve the Persian berry extract in enough water for the dye bath (4 to 4% gallons) and strain if necessary. Immerse the wool thoroughly rinsed and squeezed out of water, and boil for 30 minutes. Rinse and dry. % ounce Persian berry extract. % ounce potassium dichromate. Y& ounce acetic acid, or 6 to 7 tablespoons vinegar. Mordant the wool with alum (p. 6) and the cotton with alum-tannin-alum (p. 6) and dye as directed for Gold. Without rinsing put the dyed yarn or cloth in a boiling bath of the potassium dichromate and acetic acid or vinegar in 4 gallons of water. Stir carefully and boil for 10 minutes. Rinse and dry. 29 HOME DYEING WITH NATURAL DYES 29 poplar leaves, LOMBARDY (Populus nigra italica]The Lombardy poplar tree is widely cultivated in this country as an ornamental. The leaves can be used for dyeing. On wool, they produce a brass color that has good fastness, and a yellow-brown that has fair fastness to light and good fastness to washing. Lombardy poplar leaves do not dye cotton.Brass.—For each pound of wool mordanted with chrome, allow:1% pecks shredded fresh Lombardy poplar leaves. Mordant the wool with chrome (p. 6). Cut up the fresh leaves and soak overnight in water to cover. In the morning heat gradually, boil for 15 or 20 minutes, strain, and add cold water to make 4 to 4l/2 gallons for the dye bath. Immerse the wool material, thoroughly rinsed and squeezed out of water, and boil for 20 minutes. Rinse and dry. \Yz pecks shredded fresh Lombardy poplar leaves. Mordant the wool with alum (p. 6) and proceed as for Brass. Without rinsing put in a boiling bath of the potassium dichromate and acetic acid, or vinegar, stir carefully, and boil for 10 minutes Rinse and dry. The dye from the leaves of the privet, commonly used as an ornamental shrub, produces on wool a gold color with good fastness to light and to washing. Privet leaves will not dye cotton. 1% pecks shredded fresh privet leaves. Mordant the wool with chrome (p. 6). Soak the shredded leaves overnight in water to cover. In the morning heat gradually, boil for 20 to 25 minutes, strain out the leaves, and add enough cold water to make 4 to 4K gallons for the dye bath. When cool, immerse the wool thoroughly rinsed and squeezed out of water, and boil for 20 to 30 minutes. Rinse and dry. Sassafras is a shrub and tree common in the eastern half of the United States. The bark of the root yields a satisfactory dye for wool and cotton. On wool, it produces a rose-tan and a rose-brown, both of which have fait1 fastness to light and good fastness to washing, and a brown which has good color fastness. On cotton, it gives a dark gray, and a dark rose-tan with fastness similar to the colors on wool. 12 ounces dry sassafras root bark. Mordant the wool with chrome (p. 6). Soak the bark overnight in water to cover and in the morning boil for 30 minutes, strain, and add enough cold water to make 4 to 4% gallons for the dye bath. 30 30 MISC. PUBLICATION 230, IT. S. DEPT. OF AGRICULTUREImmerse the wool, thoroughly rinsed and squeezed out of water and boil for 30 minutes. Rinse and dry.Brown.—For each pound of wool mordanted with alum, allow:12 ounces dry sassafras root bark. Mordant the wool with alum (p. 6). Soak the bark overnight in water to cover and in the morning boil for 30 minutes, strain, and add enough cold water to make 4 to 4% gallons for the dye bath. Immerse the cloth thoroughly rinsed and squeezed out of water and boil for 30 minutes. Then without rinsing put it in a boiling bath of the potassium dichromate and acetic acid, stir carefully, and boil 10 minutes. Rinse and dry. Mordant the cotton with alum-tannin-alum (p. 6) and proceed as directed under Brown. 12 ounces dry sassafras root bark. l/z ounce ferrous sulphate (copperas). Mordant the wool with alum (p. 6) and dye as directed for Brown, using ferrous sulphate in place of the potassium dichromate and acetic acid or vinegar. 12 ounces dry sassafras root bark. Ye ounce ferrous sulphate (copperas). Mordant the cotton with alum-tannin-alum (p. 6) and proceed as for Rose-Tan, method 2. White, or smooth sumac as this species is sometimes called, is a common shrub in dry soil of the eastern half of the United States. The berries, leaves, and roots of this sumac are sources of dye materials. On wool mordanted with alum, sumac berries produce a dark yellow-tan which has good fastness, and with ferrous sulphate they give colors ranging from dark gray to black depending on the amount used. The light fastness is good and washing fastness fair. On cotton, sumac berries give a light tan or sand color and a dark gray, both of which have fair color fastness. Yz peck ripe sumac berries. Mordant the wool with alum (p. 6). Soak the berries for an hour in water to cover, then boil 30 minutes, strain, and add enough cold water to make 4 to 4% gallons for the dye bath. Immerse the wool, thoroughly rinsed and squeezed out of water, and boil for 30 minutes. Rinse and dry. 31 HOME DYEING WITH NATURAL DYES 31Gray.—For each pound of unmordanted wool or cotton, allow:Y<t peck ripe sumac berries.% ounce ferrous sulphate (copperas). Dye as directed under Dark Yellow-Tan; then, without rinsing, put the material into a boiling bath of the ferrous sulphate in 4 gallons of water. Stir carefully and boil for 10 minutes. Rinse and dry. % peck ripe sumac berries. Mordant the cotton with alum (p. 6), and dye as directed under Dark Yellow-Tan. Sunflowers contain a dyestuff that becomes more yellow in an alkaline solution. Consequently if alum-mordanted wool dyed with sunflower flowers is washed in soapsuds, its color changes from a very light yellow to a bright clear yellow. Unfortunately, though, the light fastness is poor. However, by another method of dyeing, sunflowers produce a gold color on wool that has good fastness to light and to washing. 1 Yz quarts dry sunflower flowers. Mordant the wool with alum (p. 6). Boil the dry crushed-up flowers in water for 25 minutes, strain, and add enough cold water to make 4 to 4K gallons for the dye bath. Immerse the yarn or cloth, thoroughly rinsed and squeezed out of water, and boil 30 minutes. Then, without rinsing, put into a boiling bath of the potassium dichromate and acetic acid, or vinegar, and boil for 10 minutes. Rinse and dry. The coloring principle in tea leaves is due mostly to the tannin it contains. By different methods of dyeing, tea leaves give a rose-tan and a light brown on wool, which have good color fastness. The colors on cotton are not fast. Mordant the wool with alum (p. 6). Boil the tea in water for 15 minutes, strain, and add enough cold water to make 4 to 4% gallons for the dye bath. Immerse the wool, thoroughly rinsed and squeezed out of water, and boil for 30 minutes. Rinse and dry. A darker rose-tan is obtained if the material to be dyed is put, without rinsing, into a boiling bath contaning one-sixth of an ounce of ferrous sulphate (copperas). Boil 10 minutes longer; rinse and dry. Mordant the wool with chrome (p. 6), and dye as directed under Rose-Tan. 32 32 MISC. 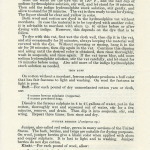 PUBLICATION 230, U. S. DBPT. OF AGRICULTUREtulip tkee leaves (Liriodendron tulipifera)Leaves of the tulip tree or so-called “yellow poplar”, found in the eastern half of the United States, produce on wool a gold color that has fair fastness to light and good fastness to washing. On cotton, this dye is not satisfactory.Gold.—For each pound of wool mordanted with chrome, use: \% pecks shredded fresh tulip tree leaves. Mordant the wool with chrome (p. 6). Soak the shredded leaves overnight in water to cover. In the morning heat gradually, boil for 20 to 25 minutes, strain out the leaves, and add enough cold water to make 4 to 4% gallons for the dye bath. Immerse the wool, thoroughly rinsed and squeezed out of water, and boil 20 to 30 minutes. Rinse and dry. Both the hulls and shells of the black walnut are used for dyes-The hulls must be collected green, and may then be dried. Many people believe that the dye prepared from dried hulls-is better than that from fresh ones. Another method is to cover the green hulls with water, and store them away from the light. The color becomes darker brown and seems to improve on standing. On unmordanted wool, black-walnut hulls give a dark brown that has good color fastness. With alum, the color is somewhat brighter, and its fastness to light is fair. Avoid long boiling of wool in the walnut-hull dye bath, for it makes the wool harsh. On cotton, the hulls produce a drab which has good fastness to light and fair fastness to washing. Dark brown.—For each pound of unmordanted wool, allow: % peck green hulls from black walnuts. Soak the hulls in water to cover for 30 minutes, boil for 15 minutes’ strain, and add enough cold water to make 4 to 4}£ gallons for the dye bath. Immerse the wool, thoroughly wet and squeezed out of water, and boil 20 minutes. Rinse and dry. % peck green hulls from black walnuts. Mordant the material with alum (p. 6), and dye as directed for Dark Brown. A darker drab is obtained if the dyed material is put, without rinsing, into a boiling bath containing one-sixth to one-half of an ounce of ferrous sulphate (copperas). Boil 5 or 10 minutes longer; rinse and dry. The hulls are collected while still green. They are then ready for use, or they may be dried and used later as needed. Or they may be put away in a wooden keg and covered with water, as was suggested for black-walnut hulls. On wool, Persian walnut hulls produce a light brown which has fair color fastness and by other methods of dyeing, darker shades that are fast to light and to washing. On cotton, they give a drab color with fair fastness to light and good fastness to washing. 1 peck dry Persian walnut hulls. 33 HOME DYEING WITH NATURAL DYES 66Soak the dry hulls in water to cover for an hour, then heat gradually, and boil 1 hour. Strain, and add enough cold water to make 4 to 4Y2 gallons for the dye bath. Immerse the unmordanted yarn or cloth, thoroughly wet and squeezed out of water, and boil 30 minutes. Rinse and dry. If the wool is mordanted with alum, a darker brown is obtained.Dark brown.—For each pound of wool mordanted with alum, allow:1 peck dry Persian walnut hulls. Mordant the wool with alum according to the directions on page 6, and dye as directed under Light Brown. Without rinsing it, put the yarn or cloth into a bath of the potassium dichromate and acetic acid in 4 gallons of water, stir carefully, and boil 10 minutes. Rinse and dry. A grayer and darker brown will be obtained if the fabric is boiled in a bath of one-sixth of an ounce of ferrous sulphate (copperas) instead of potassium dichromate and acetic acid. Drab.—For each pound of unmordanted cotton, allow: 1 peck dry Persian walnut hulls. Dye as directed under Light Brown. The zinnia flowers used in these tests were of assorted colors. On wool mordanted with alum they gave a light yellow or cream color that has fair color fastness and with chrome a dark greenish yellow with good fastness. Light yellow.—For each pound of wool mordanted with alum, allow: % peck of fresh zinnia petals and flower heads. Mordant the wool with alum (p. 6). Cut up the flowers and boil in water to cover for 10 to 15 minutes until the color is gone, then strain, and add enough cold water to make 4 to 4K gallons for the dye bath. Immerse the wool, thoroughly rinsed and squeezed out of water, and boil 30 minutes. Rinse and dry. Dark greenish yellow.—Mordant the wool with chrome (p. 6) and dye as directed for Light Yellow. Top-dyeing or dyeing one color over another is often necessary in order to obtain a desired color. To the dyer who has a sense of color and color harmony, it offers a fascinating field, but all color principles (pp. 3-4) must be rigidly followed. In top-dyeing remember that only good clear colors produce clear colors. That is, if you want a good green, start with a bright, clear yellow, not a muddy yellow or a yellow-tan, and top it with a good blue. Yellows obtained from broomsedge, fustic extract, privet leaves, or goldenrod flowers are satisfactory, but prolonged boiling of any of these is likely to dull the color. Of course, good greens are also obtained by dyeing first with indigo and then top-dyeing with the yellow. In the following recipes, dye materials yielding yellow, red, brown, and blue dyes were selected, and by dyeing one over another they produced fast shades of green, orange, reddish-purple, and black. Innumerable other combinations are possible. 34 34 MISC. PUBLICATION 230, U. S. DEPT. OF AGKICTJLTUKEBLACK AND GRAYIndigo—walnut hulls.—To get a, black or gray on wool, mordant with alum (p. 6) and dye a medium blue with either of the indigo vats (p. 20). 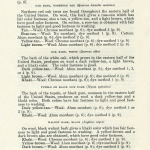 Rinse well and then dye as directed for Light Brown under Persian Walnut Hulls (p. 32) or Dark Brown under Black Walnut Hulls (p. 32). Rinse and dry.To get a black or dark gray on cotton, mordant with alum (p. 6) and follow the directions given above. The color on cotton becomes darker if the material is taken from the walnut-hull dye bath and put, without rinsing, into a boiling bath containing one-sixth to one-half of an ounce of ferrous sulphate (copperas). Boil 5 or 10 minutes longer; rinse and dry. 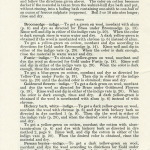 Broomsedge—indigo.—To get a green on wool, mordant with alum (p. 6) and dye as directed for Brass under Broomsedge (p. 13). Rinse well and dip in either of the indigo vats (p. 20). When the color is dark enough rinse in warm water and dry. A dark yellow-green is obtained if the wool is mordanted with chrome (p. 6) instead of alum. 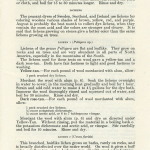 To get a yellow-green on cotton, mordant and dye according to directions for Gold under Broomsedge (p. 14). Rinse well and dip in either of the indigo vats (p. 20). When the color is dark enough, rinse the material in warm water and dry. Fustic—indigo.—To obtain a yellow-green on wool, mordant and dye the wool as directed for Gold under Fustic (p. 18). 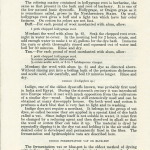 Rinse well and dip in either of the indigo vats (p. 20). When the color is dark enough, rinse the material and dry. 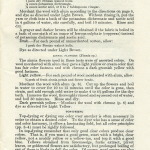 To get a blue-green on cotton, mordant and dye as directed for Yellow-Tan under Fustic (p. 19). Then dip in either of the indigo vats (p. 20) until the desired color is obtained; rinse and dry. Goldenrod flowers—indigo.—To get a dark green on wool, mordant and dye the wool as directed for Brass under Goldenrod Flowers (p. 19). Rinse well and dip in either of the indigo vats (p. 20). When the color is dark enough, rinse and dry. A dark yellow-green is obtained if the wool is mordanted with alum (p. 6) instead of with chrome. 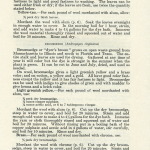 Hickory bark, white—indigo.—To get a dark yellow-green on wool, mordant the wool with chrome (p. 6) and dye with hickory bark as directed in dye method 1 (p. 9). Then dip the wool in either of the indigo vats (p. 20), and when the desired color is obtained, rinse and dry. 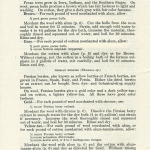 To get a yellow-green on cotton, mordant the cotton with alum-tannin-alum (p. 6) and dye with hickory bark as directed in dye method 2, page 9. 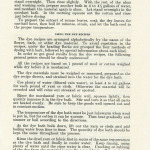 Rinse well, and dip the cotton in either of the indigo vats (p. 20). When the desired color is obtained, rinse the material and dry. Persian berries—indigo.—To get a dark yellow-green on wool, mordant and dye the wool according to directions for Gold under Persian Berries (p. 28). Rinse well and then dip in either of the indigo vats (p. 20). When dark enough, rinse the material in warm water and dry. 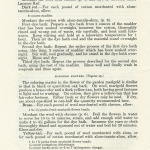 To get a blue-green on cotton, mordant and dye the cotton as directed for Yellow-Tan under Persian Berries (p. 28). Rinse and dip the cotton in either of the indigo vats (p. 20) until dark enough; rinse and dry. Broomsedge—madder.—To get a light terra cotta on wool, mordant the wool with alum (p. 6) and dye as directed for Brass under Broomsedge (p. 13). Prepare a dye bath of madder, using for each pound of dyed wool 4 ounces of madder which has been soaked overnight in water. Immerse the wool, thoroughly wet and squeezed out of water, in the dye bath and heat gradually to 140° to 160° F. Stir carefully and keep at that temperature for 30 minutes. Rinse and dry. If the wool is mordanted with chrome (p. 6) instead of alum a burnt-orange color is produced. To get a lacquer red on wool, mordant and dye as above, except this time boil the wool in a dye bath containing 8 ounces of madder for 15 minutes. Then rinse and dry. A dark henna is obtained if the wool is mordanted with chrome (p. 6) instead of alum. Fustic—madder.—To get a dull orange on wool, mordant and dye the wool as directed for Gold under Fustic (p. 18). Prepare a, dye bath of madder, using for each pound of dyed wool 4 ounces of madder which has been soaked overnight in water. Immerse the wool, which has been thoroughly wet and squeezed out of water, and heat gradually to 140° to 160° F. Stir carefully and keep at that temperature 30 minutes. Rinse and dry. If the wool is boiled in the madder dye bath a rose-brown is produced. To get a burnt orange on wool, dye as directed above, except that the wool should be mordanted with alum (p. 6) instead of chrome. Then dye with fustic and top-dye with madder. Goldenrod flowers—madder.—To get a terra cotta on wool, mordant the wool with alum (p. 6) and dye as directed for Brass under Golden-rod Flowers (p. 19). Rinse well and prepare a dye bath of madder, using for each pound of dyed wool 4 ounces of madder which has been soaked overnight in water. Immerse the wool, thoroughly wet and squeezed out of water, in the dye bath and heat gradually to 140° to 160° F. Stir carefully and keep at that temperature 30 minutes. Rinse and dry. To get a rose-brown on wool, follow the directions as above except mordant the wool with chrome (p. 6). Then dye with goldenrod flowers and top-dye with madder. Quercitron—madder.—To get a terra cotta on wool, mordant and dye the wool as directed for Gold, dye method 1, under Black or Quercitron Oak Bark (p. 11). Rinse well and prepare a dye bath of madder, using for each pound of wool 4 ounces of madder which has been soaked overnight in water. Immerse the wool, thoroughly wet and squeezed out of water, in the dye bath and heat gradually to 140° to 160° F. Stir carefully and keep at that temperature 30 minutes. Rinse and dry. To get a dark coral pink, follow the directions given above except that the mordanting should be done with alum (p. 6). Then dye with quercitron, and top-dye with madder. 36 Secretary of Agriculture Henry A. Wallace. Assistant Secretary M. L. Wilson. Director of Extension Work C. W. Warburton. Director of Personnel. W. W. Stockberger. Bureau of Animal Industry John R. Mohler, Chief. Food and Drug Administration Walter G. Campbell, Chief. Bureau of Home Economics Louise Stanley, Chief. Bureau of Plant Industry Frederick D. Richey, Chief. Bureau of Public Roads Thomas H. Macdonald, Chief. Soil Conservation Service H. H. Bennett, Chief. Weather Bureau. Willis R. Gregg, Chief. Division Textiles and Clothing Ruth O’brien, Senior Textile Chemist, in charge.